Dubbing movies have been an important part of Tollywood. Every month there are two or three movies which hit the screens. Shashank Vennelakanti is one man, who is associated with 90 % of these movies. Right from Gajhini to the recently released Indrudu, Sashank has written dialogues and dubbed for over 100 movies till date. Not many know that he is also the son of famous lyricist Vennelakanti. We caught up with the busiest dialogue writer in Chennai, for a detailed interview. Let’s see what he has to say. Q) Tell us about your beginning. How did you get into writing and dubbing ? A) As every one in Chennai knew that I was the son of Vennelakanti, I was automatically involved with films. I started dubbing from a very young age. I dubbed for Simbu and even some portions for NTR in Ninnu Choodalani. Even though I was a bright student, I was very fond of reading books, and that lead into writing. As time passed by, I dubbed for some actors and also started writing dialogues. Q) How did you bag Gajhini ? A) I have done many films before that but Gajhini was a game changer for me. My father had written song lyrics for the Telugu version, and I was brought on board as a dialogue writer. Once the film was a hit, there was no looking back. The same year Manmadha and Pandem Kodi also released and made me even more busier. Q) Which was your most toughest dubbing voice over till date ? A) There were many films which were very tough, but the crooked voice that I gave for Rahul Bose in Vishwaroopam was my toughest. Kamal Sir made me work very hard for the film, and it took lot of voice modulation for the dubbing. Q) How do you write dialogues for these films. Do you watch the film completely, or write according to the lip sync ? A) It depends on the scene. There are some scenes where I need to go with the lip sync and then there are some punch dialogues like in Singham, where I need to write according to the scene. Q) From writing and dubbing why did you get into direction ? A) When I was young, I acted in a few serials in Gemini TV. On one of the serials, I even directed some 30 episodes, and this lead my interest in direction. So I went ahead and joined Kamal Haasan sir as an assistant director. I worked with him on two films. Q) How was it working with Kamal Haasan ? A) Oh ! I have never seen such a well prepared actor and director in my life. What ever I have learnt today is all because of him. The way he goes about his films, and prepares himself much in advance is totally inspiring. In one word, Kamal Sir is like a walking library for every one. 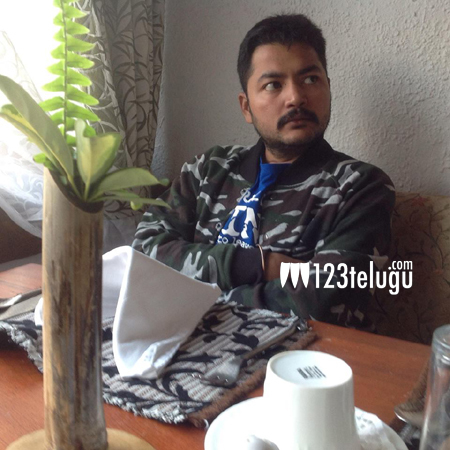 Q) So when are you writing for a direct Telugu film ? What are your future plans ? A) I have already for Nani’s Jenda Pai Kapiraju. I am slowly planning to shift to Hyderabad and start a dubbing studio soon. My studio will have a voice and script bank, where any one can come in and record their voice demo, and also submit their scripts. I am also planning to take Disney vendor ship and work on their TV shows. Q) Out of dubbing, writing and direction. Which is your favorite ? A) Undoubtedly, it is dubbing which is like meditation for me. Then comes writing and direction. Q) So do you have any films in the pipeline as a director ? A) I am planning a crime thriller with Bharatiraja Sir, which I will co direct, and there are some stories in the pipeline which will soon be finalized. Q)Who are your favorite dubbing artists ? A) I have so many but Ravi Shankar, Balu garu and Savita are my favorites. Q) What kind of films you like and who is your favorite actor in Telugu ? A) I love watching each and every film. I am a big fan of Nagarjuna and would love direct a film with him. Q) What are your upcoming dubbing projects that you have written dialogues for ? A) There are four to five films like Goli Soda, Siddharth’s Jigarthanda, Madras and Suriya’s Anjaan. I have also been offered UV creation’s movie with Anushka. Withe that we ended our conversation and wishes Sashank the best of luck for his future.